The topic of sacred architecture has been raised here quite a bit of late, specifically as it pertains to the sanctuary and altar. However, recently I was reminded again of some work by the architect Ethan Anthony particularly, and HDB/Cram and Ferguson generally, which struck me. Specifically I am thinking of the architecture Syon Abbey in Virginia -- an abbey that follows the Benedictine rule, but whose monks are not in full communion with Rome (and while I feel compelled to mention this, my sole concern is for the architecture). If I were to analyze why these particular projects have been so successful, I believe a significant factor is the traditional materials they employ. Quality stone, as would be seen in traditional architecture of this variety, features prominently in these projects -- stone of rather pleasing varieties which have a particular warmth and inviting quality to them I would add. In addition to this, there is a particular attention to the architectural details that made these styles so particularly appealing historically, be it in the details of the forms themselves or simply in the colours employed. Of course, rather than simply discuss this, what seems best is to simply show you the projects in question, with these considerations in mind, letting you make your own considerations. As I have often noted of recent, the project of giving consideration to why certain manifestations of the sacred arts and architecture are particular edifying is an important exercise, especially for those of you in a position to commission these things, or who might be in the future. I am hopeful that by bringing these various examples to you in the various realms of sacred art, it will assist you in your future projects and pursuits, giving you, even if only in a small way, some standard of judgement. "Syon Abbey is a community of Benedictine monks located on the first ridge of the Blue Ridge Mountains in Virginia, near Roanoke. In early 2000, HDB was commissioned to design a Gothic Church and monastic buildings. The designs were inspired by our study of ruined English monasteries. Constructed from imported Spanish limestone, the monastery was completed in the fall of 2007." "This recently completed new Gothic church in roughly hewn Texas limestone is located in the Spring Branch section of Houston, Texas, off Wirt Road. The church accomodates 300 worshippers and celebrants. One of the transepts houses a shrine to Our Lady of Walsingham and was built to the exact size of the legendary Walsingham Holy House, destroyed by Henry VIII during the Reformation. Carpentry and stonework are in the manner of medieval churches found near the site of the Walshingham miracle. Stained glass was made by the Willet Studio in Philadelphia. Gargoyles by local sculptors ward off evil spirits from the four corners of the tower." "St. John Neumann Catholic Church, a Romanesque-style Church that seats over 1,000, is currently in the final phase of completion. The building will include a Day Chapel and an Adoration Chapel. St. John Neumann Church is inspired by Romanesque churches of the Burgandy region in France, which saw the finest and earliest development of Romanesque architecture." Here is the music packet for the 2009 Sacred Music Colloquium, Loyola University. It is now ready for on-line viewing, minus the Vespers and one motet but it still comes in at 200 pages. No, you don't have to sing it all. There are five choirs working on putting together some of the greatest music you will ever experience at Catholic Mass. Packets will be available at the event so you don't have to print it. Finally, anything in the Parish Book of Chant is not in here. This is an unusual conference in the sense that it is not a trade show, not a series of lectures. It is a participation event for all singers and musicians. The purpose is to provide real-time experience, a full immersion in sacred music. I personally believe that this event is one of the most remarkable in the world today, an event that shouldn't exist by measure (no funding, where's the real interest, etc. etc.) and yet it grows and grows. It changes lives. The training you get here makes it possible to serve the faith in ways you never imagined possible. Note: the Vespers service, one Psalm, and one motet are missing, so the packet will be more than 200 pages once complete. St. Francis de Sales Oratory and its Director for Sacred Music, Mr. Nick Botkins, are pleased to announce a nine-week course in Gregorian chant for beginners. The lessons will be offered once a week on Wednesday evening from 7:30-8:30 PM in the Oratory hall. The course runs from June 3rd to July 29th. Information brochure is available by contacting the Oratory (314) 771-3100. Continuing our series regarding Jewish salvation and the liceity of the extraordinary form Good Friday prayer for Jewish conversion, here is part II of the statement of Bishop Gerhard Ludwig Müller (see part I here and Dr Thomas Pink's Introduction to it here and here). We must distinguish between, on the one hand, any reduction either of Judaism or of Christianity, both of which know themselves to derive from a divinely given covenant, to ethics as a humanly self-sufficient way to God - indeed almost to a claim on salvation - and on the other hand recognition of the fundamental human right to religious freedom (Vatican II Dignitatis Humanae §2). In this sense the Second Vatican Council teaches that each person has the right and duty to follow their own conscience in matters of religious conviction and moral action and in this way to fulfil the rule of truth and goodness (Dignitatis Humanae §3). 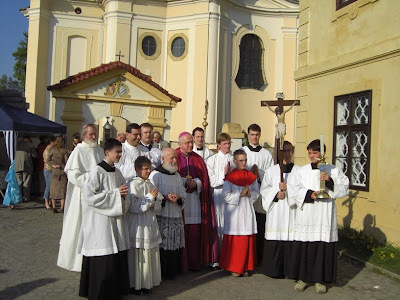 Hence those people can be saved and attain final communion with God who through no fault of their own lack belief in Jesus Christ, indeed under certain circumstances even lack belief in the existence of a personal God as creator and consummator, but not – and this is decisive – without the grace of Christ working invisibly within them. Since from a Christian viewpoint nothing can be said of God apart from Jesus the Christ, the incarnate Word, and apart from the Holy Spirit eschatologically poured out 'upon all flesh' (Acts 2, 17), the salvation that comes from God is always through Jesus Christ and through the inner working of the Holy Spirit (Vatican II Gaudium et Spes §22). The explicit confession of Christ and the making concrete of that confession in membership of the Church, a life based on the sacraments and on following after Christ - these are therefore necessary as means to salvation for all who recognize Jesus as the Christ. Mutual respect without qualification of one's own belief. Walter Cardinal Kasper stressed that if one 'is convinced, with Scripture, of the universal salvific significance of Jesus Christ' one cannot speak of two ways to salvation, one for Jews and one for Christians. Rather in the relationship of the Scriptures of the Mosaic covenant and of the New Testament there is revealed a common salvation history, within which 'the Jewish people remains God's chosen people', a people whose covenant is confirmed, surpassed and universalized by Jesus Christ (Walter Kasper, Where the Heart of Faith Beats: the Experience of My Life, Freiburg 2008, pp294f). Credal differences result from the diverse reactions of men following their own conscientious conceptions of the truth in relation to God's self-revelation. People of differing faiths can therefore live together in complete mutual respect with people of other religions and work together in friendship for the construction of a single society based on ethical principles founded on religion or natural law. But they can also bear their differences without attributing to each other false or evil intentions. A qualification of each party's own binding creed would, on the other hand, make any dialogue superfluous. Such dialogue is however both sensible and mutually beneficial since particularly between Jews and Christians the fact of an historical self-revelation of God is not in dispute, even if there remain diverse convictions about the scope of that revelation, that is about its culmination in the person and mission of Jesus Christ. 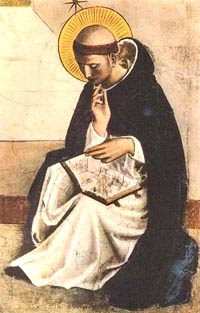 Hence it would be a reduction of Catholic teaching about the realization of the universal salvific will of God in Jesus Christ and about Christ's sole mediation of salvation and about the consequent necessity to salvation of the Church and of baptism, as well as about the possibility of salvation of those who, through no fault of their own, lack belief in Christ, if alongside and independent of these conditions there were also a way to salvation 'even apart from recognition of Jesus Christ and apart from the sacrament of baptism' (ZdK Declaration p5) as something confirmed by God himself. A reader from Norway sent in interesting news of the founding of a Cistercian monastery in that country -- a country whose official religious affiliation is evangelical Lutheranism -- in Munkeby, near the site of a mediaeval Cistercian monastery long in ruins. Munkeby, the "place of the monks" was the third and northernmost Norwegian monastery established by the Cistercians in the 12th century. It was located, typically, close to a river, in central Norway's Trøndelag region. Nearby were the crossroads of a trade route to Sweden, and the popular pilgrimage road from Trondheim to Stiklestad, where Saint Olav fell in battle in 1030 implanting Christianity. The new Munkeby Mariakloster - kloster is Norwegian for monastery - is being constructed over the foundations of a farmhouse in a sheltered rural environment of forest, farmland and pasture. Wood and stone will be primary building materials to blend with the natural landscape. Next door neighbors and the Levanger commune have warmly welcomed the return of Cistercians, and await the rediscovery of a past that is somehow still present in their hidden memory and in the nearby monastic ruins. Cistercian Nuns are also found nearby. ope Benedict XVI views the relic of Pope Celestino V during his visit to the earthquake-damaged St. Maria of Collemaggio church in L'Aquila April 28, 2009." The NLM was sent a link to this blog which has up a number of images from the recent Eucharistic Procession at the University of Notre Dame. 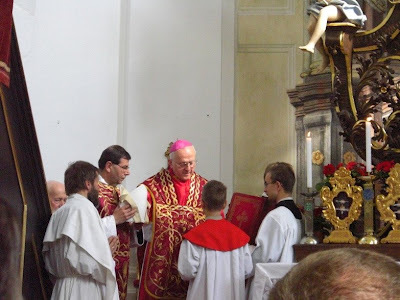 After the Introduction by Dr Thomas Pink (Part I - Part II) we now come to the statement by Bishop Gerhard Ludwig Müller of Regensburg himself (you can find the German original at the site of the German Bishops' Conference here). The Chairman of the Committee for Ecumenism of the German Bishops' Conference, Bishop Dr Gerhard Ludwig Müller, has written a statement regarding the Declaration of the 'Jews and Christians' dialogue circle of the Central Committee of German Catholics (ZdK) "No to Mission to the Jews - Yes to dialogue between Jews and Gentiles". The Church's confession of Christ has its source in the living encounter of the disciples with the person of Jesus. The primitive Church recognized in him the Word which is God, and that has taken flesh for the sake of our salvation. 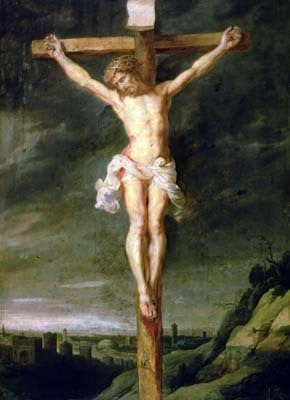 Through his preaching, teaching and saving works and finally through his death on the cross, his resurrection from the dead and the outpouring of the Holy Spirit, God the Father, Son and Holy Spirit has communicated himself to all men as truth and life in a way that cannot be surpassed by any new revelation and that is final (eschatologically). 'The Christian dispensation, therefore, as the new and definitive covenant, will never pass away' (Vatican II Dei Verbum §4). With this understanding the Second Vatican Council summarises, in the Dogmatic Constitution on divine revelation, employing the highest level of magisterial authority, the fullness of the Church's confession of Christ both in its origin in Scripture and in its unfolding in faith in the greatness of Tradition. As far as the relation to each other of the Jewish and Christian faith-communities is concerned, there is a common frame of reference - a faith-hermeneutic which is profoundly theological, and which is qualitatively removed from comparisons made from an historical or a literary point of view. Believing Jews and Christians both presuppose that God can reveal himself in history and that in fact he has revealed himself as creator of all men and as saviour and redeemer of his chosen people. The Holy Scriptures of Israel and of the Church witness and contain the Word of God expressed in human language. The Jewish Bible and the Christian Bible (in the Old and New Testaments) are therefore not purely human interpretations which, on the model of liberal theories of projection, assume for themselves 'God' as fictional subject of some salvation-historical revelation in word and deed (and so introduce ‘God’ only 'as if' he were a 'person'). 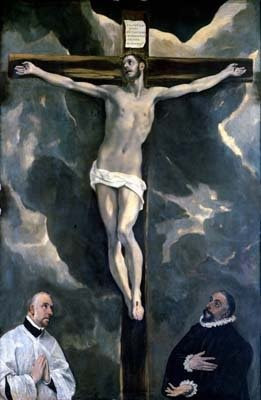 What differentiates the confession of Jews and Christians is not the affirmation of a real action on the part of God in the covenant for Israel and a merely human interpretation of the figure of Jesus in the New Testament writings, but the question whether Jesus really is the promised Messiah, and whether the incarnation, the atoning death on the cross and the resurrection from the dead really have been effected by the same covenantal God, the God and Father of Jesus Christ, . In the text of the 'Jews and Christians' dialogue circle of the ZdK, by contrast, the dividing line between Jews and Christians is placed merely in the 'idea' of the Trinity and of the incarnation. But for Catholics and for all Christians who recognize the creed of Nicaea-Constantinople, the mystery of the Trinity is not some metaphor of the closeness and love of God applied to God from without, but the revelation of the innermost being of God which he himself declares to us men in the true historical incarnation of the Son of God and in the outpouring of the Holy Spirit, and within which being we are included. Salvation is becoming filled with the love of God - now and forever through eternity. We then can no longer speak of the universal salvific will of God apart from his being made present, both historically and eschatologically, in Jesus Christ, the sole mediator between God and man. There is no mention that the mystery of and confession of the Messiah is central to all the gospels. Mary, who has conceived Jesus through the working of the Holy Spirit, is commanded to give her son the name of Jesus (Matthew 8, 29; John 11, 27) 'because he will redeem his people from their sins' (Matthew 1, 27). Jesus is designated prophetically as the 'shepherd of my people Israel' (Matthew 2, 6). To restrict the redemptive action of Jesus Christ to the Gentiles that live outside the people of God that is Israel - this would be to turn the entire witness of the Bible on its head. Rather, it is congruent with the sovereignty and uniqueness of God that HE approaches us by the path of election, vocation, covenantal grace, redemption, justification and - as Christians confess - incarnation. Men then can follow the way of God to their salvation if they show him the 'obedience of faith' (Dei Verbum §5), which shows itself in love of God and neighbour in fulfillment of the will of God in his commandments. 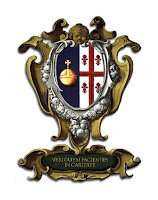 The Easter Season Vesperal for the modern Liturgy of the Hours following the Dominican Use is now available at ﻿Dominican Liturgy for download in PDF format. This Vesperal gives the Dominican Versions of the Gregorian music assigned for use with the Latin Liturgia Horarum according to the Ordo Cantus Officii (1983) issued by the Sacred Congregation for Divine Worship. Also included are additions and variants provided in the Proprium Officiorum Ordinis Praedicatorum (1982). In addition to Vespers, the Alleluias that may replace the psalm antiphons of the Liturgia at Office of Readings, Lauds, and the Little Hours are also included, along with the Antiphons at the Benedictus. The music for Vespers of the feasts of the Annunciation and St. Joseph when celebrated in Easter time follow the Psalter. I apologize for the lateness of this posting, especially to those who have been waiting for this material for personal use. A computer problem had to be rectified before I would edit the music for this project and create PDF files. In order to make this available as quickly as possible, I have posted this Vesperal without the Commons of the Saints. I need to complete the revision of the antiphons and responsories to include alleluias. Once this is done an updated version will be posted. This morning begins with a concelebrated Mass in the OF, the Feast of Catherine of Siena. The old calendar's same feast is tomorrow - in light of how many changes were made to the new calendar, it is not far off. No reason for further comment. After the Mass and some coffee, its back to the trenches with sung orations, the Vidi Aquam, Pater Noster, etc. In the afternoon participants will begin work on singing the lessons: the prophesy, epistle, and gospel tones. We'll be joined by another faculty member today, David Hughes, organist and choirmaster from just up the road at St. Mary in Norwalk, CT.
We all had the privilege last night of listening to a lecture by Monsignor Stephen DiGiovanni of St. John the Evangelist, our host. The point of the talk was to give participants a list of four or five practical changes they can make in their parishes, changes pastors must make, in order to bring about the reform of the reform. The talk was well received (standing ovation), thoroughly engaging, and scholarly and accessible at the same time. The Monsignor has been asked to write up his talk for publication in the CMAA's quarterly journal, Sacred Music. World Library Publications now has a blog, run by Jerry Galipeau, the associate publisher, at which they link such "contemporary" Sanctus settings as this one and this one. Oh, the post also links a Youtube of chant, as if to say "whatever floats your boat." 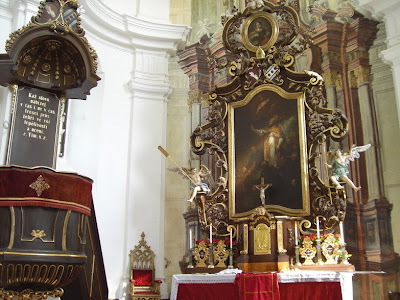 And yet, I think most learned musicians in the Catholic world would not say that liturgy can be completely indifferent to the choice between styles. Fortunately, the blog post leaves comments on, so I'll close them here. Addendum: the blog moderates comments, so yours may or may not appear. 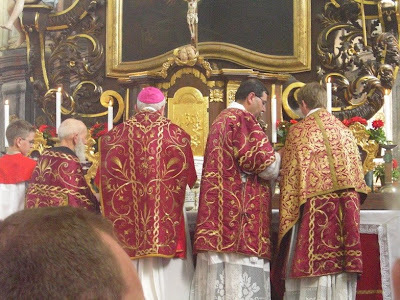 The growing interest in saying the Extraordinary Form of the Mass in post Summorum days has yielded a growing number of pastors wanting to take the next logical step toward solemnity: learning to sing the High Mass in the Extraordinary Form. A large group of these noble trailblazers have gathered today at St. John the Evangelist Church in Stamford, Connecticut to learn to sing the Ancient High Mass at the Church Music of Association of America's spring program, Sung Extraordinary Form: A Seminar for Priests and Seminarians. The conference runs through Thursday, April 30th, and will culminate in an Extraordinary Form High Mass on the Feast of St. Catherine of Siena, Rev. Scott Haynes, S.J.C., celebrant. The mass will be on Thursday, April 30th at 12:10pm at St. John's. The public is invited to attend. Faculty includes Monsignor Stephen DiGiovanni of St. John the Evangelist, Scott Turkington, internationally known chant master and choir master at St. John the Evangelist, and the Reverend Scott Haynes, S.J.C, Associate Pastor at St. John Cantius in the Archdiocese of Chicago, Illinois. The sessions are resuming, with Father Haynes launching into an explanation and compelling history of the many different forms of the Mass. I will try to listen in now and continue with my report throughout the duration of the conference. One question still remains. Has not the post-Conciliar magisterium renounced a 'Mission to the Jews' understood precisely as a targeted programme of conversion aimed at securing the final conversion of all Jews to Christianity? Such a renunciation would make perfect sense in terms of a dual covenant theology. And indeed Cardinal Kasper himself in a widely read article in Osservatore Romano of April 10, 2008 sought to explain the extraordinary form prayer for Jewish conversion in terms that do eschew a 'Mission to the Jews' specifically so understood. The final conversion of the Jews, he has observed, is an eschatological event associated by St Paul in Romans Chapter 11 with the coming again of Christ from Zion. It is not therefore something which the Church should be taking active steps to bring about by itself in the here and now. Naturally, Christians must, where it is opportune, give to their older brothers and sisters in the faith of Abraham (John Paul II) a witness of their own faith and of the richness and beauty of their faith in Christ. Paul did this as well. During his missionary journeys, Paul always went first to the synagogue, and only when he did not find faith there did he go to the pagans (Acts of the Apostles, 13:5,14ff., 42-52; 14:1-6 and others; Romans 1:16 is fundamental). A 'Mission to the Jews' understood as a strategy to end the very existence of Judaism as a religion rejecting of Christ - that would be to address an eschatological matter properly in the hands of God alone. But St Paul's general evangelisation of Jews along with and even before Gentiles, a strategy aiming at individual conversions - Kasper in fact endorses that. St Paul's missionary strategy would certainly have no place in a dual covenant theology. So the liberals have remained unmollified and the protest and outcry has continued, with the strongest objections to the prayer for Jewish conversion coming from liberal theologians in the United States and Germany. And that reminds us that the real explanation for these objections may not lie in some compelling theological principle, but rather in a crisis of Christian guilt following the Shoah - a guilt that given the ethnic politics of the US and the history of Germany, is likely to be particularly deeply felt by Christians in those two countries. But such feelings of guilt, however warranted and understandable in themselves, do not constitute any theological argument sufficient to compel revision of fundamental Catholic teaching about Christ. Indeed how could there be a theological principle compelling in terms of orthodox Catholicism for viewing Christ's and the Christian mission as being specifically to the Gentiles and not to the Jews as well? How can Christ's redeeming work, and then human acknowledgement of this work through faith and participation in it through baptism all be less necessary for Jews than Gentiles? 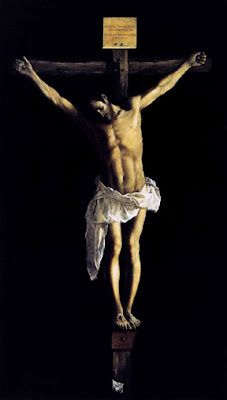 For Christ's sacrifice is required to undo the sin of Adam, the father of us all. The alienation from God that is involved in original sin, and that only Christ can repair and end, is not an exclusively Gentile predicament. At the same time, from the prayers and thanks of Mary, Simeon and Zechariah onwards, the New Testament very consistently presents Christ's universal redemptive work in terms of his fulfilment of specifically Jewish hopes for a Messiah to save Israel. "Christians today maintain along with Jews that the ethical action of general humanity opens up a way to God that goes beyond all differences of belief." Far from salvation being through faith in Christ and baptism, what saves us is nothing more than praiseworthy human moral action. Christ's role is no more than to call us to follow a moral code - a moral code that had already been sufficiently presented to Israel in the teachings of the Old Testament. So the Jews have no need specifically to follow Christ. But nor, of course, in a sense do we - provided that we all do what is right. Christ is just a moral teacher, albeit perhaps one who for Christians is supremely representative of and communicative of the divine goodness. So while moral action is demanded of all, attention specifically to Christ is just another faith-option - and one which, given the history of Christian ill-treatment and persecution of the Jews, it would be unwarranted and oppressive, as well as strictly unnecessary, even to recommend to the Jewish people. The idea that all humans are burdened by original sin, and that faith and baptism in Christ is what releases all of us, Jew and Gentile alike, from this burden - this is just dismissed by the Declaration as an outmoded pre-Conciliar theology (see ZdK Declaration pp7-8). 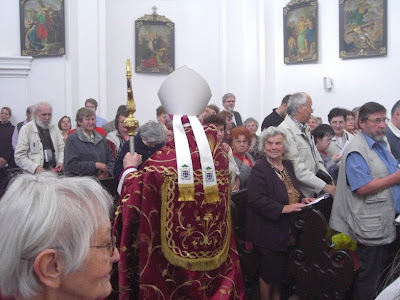 At the heart of objections to the extraordinary form of the Roman rite and its prayer for Jewish conversion lies then the Pelagianism so characteristic of modern liberal Protestantism - a Pelagianism that, it is now very clear, has entered deeply into the belief of important parts of the German Catholic theological establishment. - that Jesus is the Jewish Messiah and that his role as such is one with his role as universal saviour of mankind. - that all are saved in the same way from sin by the one sacrifice of Christ. - that participation in that saving work through faith and baptism is no less necessary for Jews than for Gentiles. - that the Church of the New Covenant is indeed to be, as Lumen Gentium teaches, the new People of God made up of Jews and Gentiles alike. - that Christian dialogue with Jews in no way excludes a Christian mission to evangelize all peoples, Jews along with Gentiles, and that Christian mission ought not to be discredited by association of it with past Christian oppression of the Jews, an oppression that was opposed to Christian faith and witness properly understood. - that the Declaration of the ZdK forswearing any kind of mission to the Jews has no doctrinal standing whatsoever, and indeed lacks any coherent or plausible grasp of its subject. The Declaration's suggestions of a supposed discontinuity between pre- and post-Conciliar Catholic teaching on Jewish salvation, or of a similar supposed discontinuity between the teaching of Vatican II and John Paul II and that of Benedict XVI, are completely misguided. 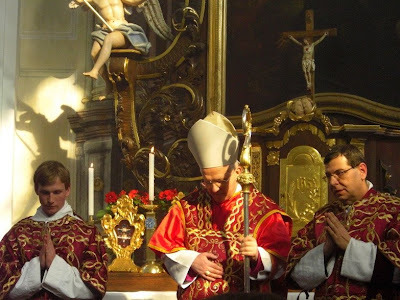 For those of us who value the traditional liturgy of the Roman rite, there are two lessons to be drawn. 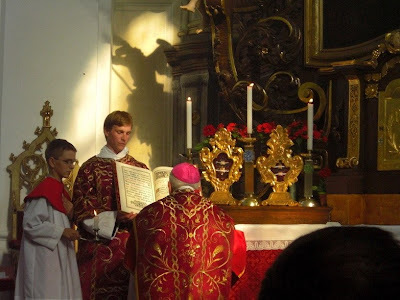 First, that Summorum Pontificum has clearly been of vital importance in nerving even those parts of the world episcopate less than fully sympathetic towards the 1962 Missal to reassert the continuity of orthodox Catholic teaching on human salvation - a teaching that the traditional liturgy presents without ambiguity, and indeed with unsurpassed beauty and clarity. 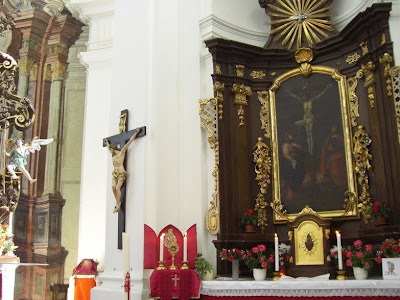 Secondly that behind opposition to the Good Friday prayer for Jewish conversion lies an even more profound source of opposition to the traditional liturgy as a whole - which is a theological Pelagianism that clearly finds the deeply Augustinian orthodoxy of the traditional Roman rite unbearable. But is not such a Pelagianism just the enemy of Christianity itself? Much that extends far beyond the liturgy itself is at stake in Pope Benedict's liturgical programme. The Holy Father, and the bishops who support him, deserve our prayers. Dr Thomas Pink is Professor of Philosophy at King's College London, who is working on (amongst other things) conceptions of religious liberty, religious coercion and relations between religions held by Catholics from the Counter-Reformation onwards, and who is preparing an edition of Francisco Suarez's moral and political writings. From Ted Marier's wonderful hymnal, now out of print, The Divine Praises, posted with the permission of the copyright owner. I seem to have this disability that I can only memorize something when it is sung, so at last I might finally commit this to memory, and not feel the disgrace of being the only person present who has to look at the text. Some video was sent to the NLM from Solemn Vespers at the Toronto Oratory, which is celebrated at their parish of Holy Family Church every Sunday evening at 5:00pm, followed by Solemn Benediction of the Blessed Sacrament. I know a number of our readership have commented of late that they would be interested in reading and seeing more on the Divine Office. The NLM is happy to oblige in this regard, sharing your enthusiasm for this, most especially as it relates to the public, sung celebration of the Office in both Cathedral and parish settings. 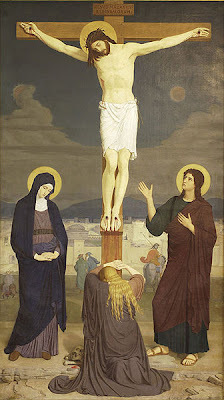 No doubt most readers are aware of the controversy which arose after the reformulation of the Good Friday intercession for the Jews in the usus antiquior by Pope Benedict XVI in 2008 and the very important questions raised in this context. While preeminently theological in nature, these are, as so often, deeply related to the liturgy, as here again applies the famous axiom lex orandi lex credendi. The NLM is therefore very happy to present to you an English translation of a recent and very important statement which Bishop Gerhard Ludwig Mueller of Regensburg put out on behalf of the whole German Bishops' Conference defending both Catholic orthodoxy regarding Jewish salvation and the licitness of the extraordinary form Good Friday prayer for Jewish conversion. The translation was done by Dr Thomas Pink (with some little help and advice by myself), who has also written an excellent introduction to the document for the NLM. I will be posting this in several parts, and begin today with the first part of the introduction. Nothing following the motu proprio Summorum Pontificum of Pope Benedict XVI has caused more theological protest among Catholic liberals than the Pope's refusal to replace the 1962 prayer entitled Pro conversione Iudaeorum - 'For the conversion of the Jews' - in the intercessions of the Good Friday liturgy in the extraordinary form with the 1970 prayer entitled simply Pro Iudaeis - 'For the Jews' - that is to be found in the ordinary form of that liturgy, and which, though it prays for Jewish redemption, makes no explicit reference to Jewish conversion to Christ. True, the content of that 1962 prayer for Jewish conversion was revised by the Pope in 2008. But the revision seems merely to have removed language referring to Jewish blindness and darkness that was seen in many quarters as needlessly insulting. Indeed, the new 2008 revision not only retains its 1962 title referring to conversion. It also states expressly as the 1962 prayer previously did not that Jesus Christ is the saviour of all people, and makes it explicit that the salvation of the Jews involves their acknowledgement of him as such. The introduction to the new 2008 prayer characterizes it as being specifically for the Jews to recognize Christ as the saviour of all and so, in particular, as their saviour; and then the prayer itself asks for Israel to be saved - something which therefore must inherently involve acceptance of faith in Christ as redeemer. The liberal protests are based on their allegation that the Second Vatican Council changed Catholic teaching about Jewish salvation. Before the Council, Jewish salvation was taught by the Catholic Church to depend, just as did Gentile salvation, on conversion to faith in Christ and entry through baptism into the Church - the Church being a New Israel to be made up of Jew and Gentile alike. Whereas according to the dual covenant theology favoured by these liberal protestors and associated by them with the Council, Catholics should now admit that the Jews have in fidelity to the Old Testament Covenant a promise and means of salvation that is both unrevoked and quite separate from the way taken by Christians who follow Jesus Christ as their redeemer. The text that is alleged to support this is the conciliar decree Nostra Aetate with its Pauline message that the promises made by God to the Jewish people are irrevocable. It is true that Vatican II allows that people can be saved without actually receiving baptism of water in this life, and also without attaining explicit faith in Christ during their lifetime. And so this possibility applies also to the Jews. But this admission was by no means original to the magisterium of Vatican II, and is arguably rooted deeply in previous Church teaching at the highest level (see Quanto conficiamur moerore of Pius IX and Suprema haec sacra of the Holy Office under Pius XII). And the admission certainly does not involve treating Judaism as offering for Jews an alternative and self-sufficient means of salvation besides that offered to Christians. For example Vatican II still insists that anyone who recognises the truth of the Catholic Church's claims must enter or at least intend to enter the Church through baptism if they are to be saved (see Ad Gentes §7 on Christian mission). Jews are not exempted from this requirement, which they would be if, consistently with Catholic truth, they had their own separate path to salvation. Moreover, whether or not the 1970 Good Friday prayer is unclear about the terms of Jewish redemption, the 1970 Liturgy of the Hours, as has been pointed out by Gregor Kollmorgen and Fr Brian Harrison, is full of prayers that the Jews recognize Jesus as their Messiah and Redeemer. The natural conclusion is that as a promise of salvation the Jewish covenant has indeed not been revoked - but rather has been fulfilled, being continued, in a more perfect and universal form, in the covenant of the New Testament. The Old Covenant has not been cancelled by the New, but has been transformed. Judaism is mistaken, not in thinking that it is involved in a still valid saving Covenant with God, but in the nature and true basis of that saving Covenant, which in actual fact involves all of humanity, Jew and Gentile alike, and which operates solely through the sacrifice of Christ. Christ's role as true Messiah of the Jews, the Messiah promised in the Old Testament, is just his role as universal saviour of mankind, the saviour proclaimed in the New Testament. And that seems indeed to be precisely the position of official post-conciliar Roman theology. 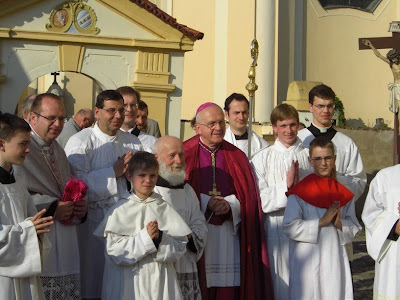 Last Saturday, Feast of St. Marcus, Archbishop Raymond Burke, the Prefect of the Apostolic Signatura, pontificated in the Extraordinary Form in the Basilica of the Immaculate Conception at Lourdes in the context of the annual pilgrimage of the Institute of Christ the King Sovereign Priest (ICRSS). 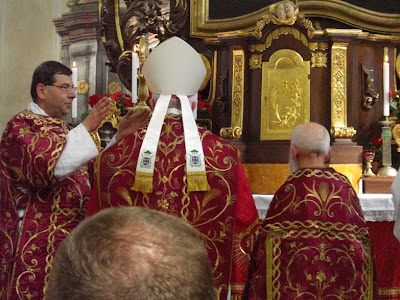 As the Spanish blog Benedicámus Dómino reports, afterwards the Archbishop gave a talk and a Q&A session, and on the Sunday the Superior of the ICRSS, Gilles Wach, celebrated Solemn Mass, again in the Basilica, at which Archbishop Burke assisted. 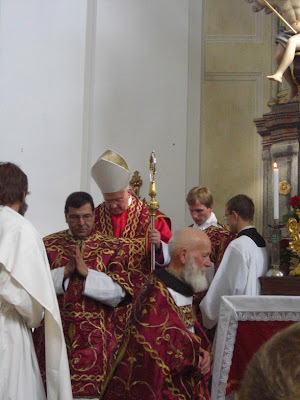 Here are some picture from Benedicámus Dómino, and also from Fr George David Byers's bloggingLOURDES. Yesterday's "Good Shepherd Sunday" consideration of some Roman mosaics may have, by happenstance, also given you the opportunity to give some consideration to the architectural feature of the ciborium over top the altar -- an oft promoted architectural feature here upon the NLM -- since all but one of those venerable churches and basilicas included this element. 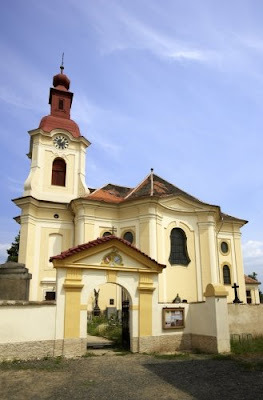 We are fortunate to slowly see ciboria re-appearing today in some projects -- though it is to be hoped that we will likewise begin to see it appear, not only in larger-scale church building projects, but also in those of a smaller scale, as well as a consideration for parish renovations where it would be suitable and reachable. This inspired a further consideration of yet another architectural feature that we haven't spoken upon for awhile, but which would also be well deserving of continued architectural expression: the rood and rood screen. I should note that in such an instance, I would propose that the altar would ideally be well-vested with a dignified antependium (which further draws attention to the altar itself), appointed with tall candlesticks, candles and altar cross appropriate to the proportions of the altar, screen and church -- and in visual continuity with the same; and the altar should be up upon a step (predella) to separate it from the rest of the sanctuary. Behind the altar, one could still employ some sort of wall-mounted triptych if further detail was needed, or other ornamental sacred arts -- not to mention a tabernacle or hanging pyx and so on. The options are various and would have to be looked at on a case by case basis, but it seems to me to be a possible option that heretofore may not have been considered in parish construction or renovation. With that, I'd like to offer for your consideration some beautiful images of rood screen which may help to foster this consideration. We cannot show rood screens without making reference to our own Brother Lawrence Lew, who has captured numerous stunning photographs of such. 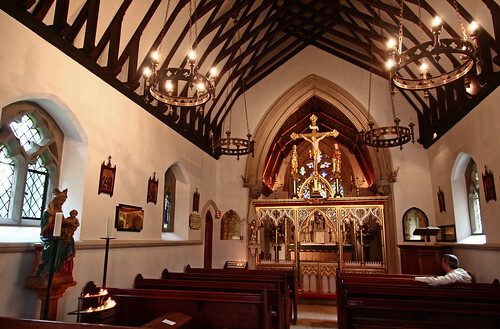 Finally a couple of images from St. Mary's church in Bruton, Somerset, England (courtesy of this site).